Hi Wanda. I’m very pleased you stopped by. And I loved your description of your week. Don’t days like this keep us humble and entertained…? Childbirth Deception essay. As if childbirth weren’t already chaotic enough! Here’s how I managed to make our #3 delivery more interesting. You should post some photos of your quilting work. I’d enjoy seeing them. Blessings & great health to you. Let me know if I deliver as promised. If you had a bit of a rowdy or audacious spirit, then I’m pretty confident. Some days (weeks!) are like that. So glad that things worked out for you. 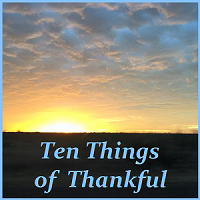 Nice to see you at the Ten Things of Thankful! Thank you. Love the idea of recalling what we are thankful for. Oh my, it sounds like you are a bit over-extended. Take a breath and post a calendar at eye level. I get appointments and days mixed up sometimes. I keep a pocket calendar that helps a lot, especially as I keep track of my own commitments and those of my fathers and mother-in-laws as well. Double booking is sometimes an issue. Dollar store two year monthly pocket calendar. Added bonus – pictures of tropical beaches on each page. I suppose it is better to be a day early than a day late. I really enjoyed reading this post. At least you were ahead of the game. It is too bad you had to feel so much pressure to get your quilt commitment done when it didn’t need to be done until a week later. Better to be to the doctor’s a day early than a day late. 🙂 I think we have all had days and weeks where we have felt a little out of kilter. I think you and I had the same week! On two different days I showed up on time to where I intended to go only to take a quick peek in the rearview mirror and discover I hadn’t done a thing to my hair nor put on a drop of make-up. As someone mentioned it was completely a result of being over-extended (and for far too long). Here’s hoping we both recuperate. May I suggest you use the time you would have spent on that quilt this week and just allow yourself some peace and quiet? There you go—silver lining! Yes it was. I relaxed and spent time blogging.